This living room is the perfect place to entertain your family. Hardwood floors, granite tops stainless appliances & eating nook. There are 3 full bathrooms and an outdoor shower! Sunny family room has kitchenette, counter seating and SMART TV. Spacious master down & upstairs bedroom both have queen bed & TV. Bring the family together in this spacious, casual dining area. Bunk beds and queen bed and with cedar closet upstairs. Grill, 2 seating areas, outdoor shower, patio and large yard. Two bedrooms upstairs with full bath. This pristine 4 bedroom, 3 bath charming Cape Cod home is only 0.2 mile to Pleasant Road Beach with an excellent location close to shopping, restaurants, golf, tennis, bike trail and grocery stores. 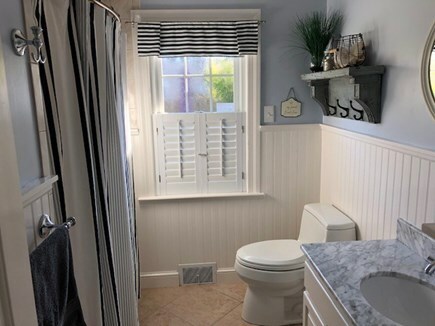 Recently renovated, this home features a new kitchen with granite countertops, tasteful décor, flat-screen TVs, wireless Internet, washer/dryer, bonus family room with a full kitchenette, and central AC. See more pictures https://photos.app.goo.gl/2XAZiVfAz73LW8Tp1. Purchased in 2011, this home has been completely transformed into a charming beach house just steps to Pleasant Road Beach. Attention to detail and convenience makes this your perfect family and friends vacation destination. The family room with wet bar/kitchenette is the perfect place to unwind after a long day at the beach. The cross breezes in this room are amazing. The backyard has a large grassy area and a 600 sq.ft. patio. In addition, the rustic garage has an indoor/outdoor ping pong table for play and many yard games. Just open the back garage door and play inside or out. You won't be disappointed with the cleanliness, comfort, convenience and beauty of this home. This is a charming home that is waiting for lucky vacationers like you! Don't miss this opportunity to enjoy your vacation on Cape Cod. This home is lovingly maintained with attention to detail. We love our beach home and are constantly making improvements to the property so that our guests are as comfortable here as they are at their own home. Bedroom Arrangements: Two of the four bedrooms are upstairs with a full bathroom. One bedroom has a queen bed and the other one has bunk beds (2 twins) and a queen bed. There are two bedrooms downstairs. One bedroom has 2 twin beds and the other is the master bedroom with a queen bed. New for 2018 is Central Air Conditioning. When the weather gets cooler the patio is a favorite gathering spot for the family. This home is a great place to bring your family and friends, have a reunion or switch it up and have a girls shopping or guys golf week. Additional pricing info: Refundable security deposit $500;Cleaning fee $200;Tax of 12.45% (5.7% MA , 4% town, 2.75% CC water), State and local taxes of 12.45% will apply. Just wrapped up a week at Robyn and Greg's beautiful West Harwich Cape house! We were two families traveling together with our 3 young kids (3 and under). The house was perfect! With two bedrooms up and two bedrooms down we were able to spread out. The secondary living space was a great spot for early morning wake ups or late night adult time. The house is beautifully renovated and well appointed! Had everything we could have needed - including two fridges! The outdoor space was wonderful, too, with many different seating options for lounging or outdoor dining. Robyn and Greg made so much of their beach gear available - cart, wagon, chairs, etc, which alleviated space constraints in the car! The beach is a short stroll away. We found it to be surprisingly quiet. The kids loved playing in the sand and searching for sea shells. Easy access to Harwichport and Dennisport and Rte 28 for mini golf, inflatable park and indoor water park. We had a wonderful vacation on the Cape and we were sad to leave. Your home is beautiful and you really supplied us with so many things to make our trip easier. My son loved being carted to the beach each day in his own personal wagon! We were lucky to have beautiful weather and it was HOT! The only thing we wished we had was a fan in the family room. Sleeping was very comfortable with the window AC units but at night we enjoyed spending time in the back family room and towards the end of the week when the humidity was high, we wished we had a fan to circulate the air. Other than that, we really had everything we needed. I especially liked the little things, like the garbage coming twice a week. Wonderful week by the beach! The house is even more beautiful than the pictures! Robyn and Greg's clean, bright and spacious home was the perfect backdrop for our fist Cape Cod vacation. Right around the corner from the beach, this comfortable home was roomy enough for two families. The amazing location allowed us to walk to Pleasant Beach AND to the town of Harwich Port. A short drive to Chatham, this house also had some great restaurants nearby such as Brax Landing and the Wee Packet. I can't say enough about how responsive Robyn and Greg were to our needs and how beautifully kept this house was. We loved morning coffee on the back porch and the outdoor shower. We hope to be back again next year! Our family planned a week-long trip in Cape Cod and this house was perfect for the number of people we had. It was very clean and had everything we needed. We had a wonderful vacation stay in this extremely well kept and comfortable home. The pictures don't do it justice and the house is roomier than it appears. We stayed with our two young children, ourselves, and grandparents and never felt like we were on top of each other. The neighborhood is quiet but convenient to the beach, the wedding venue, restaurants, and shops. Harwich Port is very nice, it has enough of everything you need. The owners of this home have put a lot of thought and nice touches in this home even down to beautiful cut hydrangeas on the tables. The house has a great layout and in the mornings when the kids were up early we could go in the back room without waking anyone else up. Or, when someone wanted to read and enjoy the breeze in the front room, the kids could enjoy playing the Wii in the back room. Plenty of windows let us enjoy the mild Cape Cod air, a luxury we don't often get to enjoy in NC. We could have easily stayed in this home another week! This was the perfect vacation home! The owners have thought of everything, and the home is well equipped with anything and everything you might need for the perfect vacation! Which makes packing and vacationing so much easier- lobster pot, pack and plays, beach chairs, she has it covered! The home is immaculate and decorated beautifully. We loved that the TV room is separated from the main living area, which allowed for late nights and early mornings that didn't disrupt anyone's sleep! The kitchen is perfect and had everything we needed for home cooked meals. The backyard is like a retreat, with two dining areas and plenty of room for games and little ones to run around! We traveled with 6 adults and 3 kids but we never felt like we were on top of each other, and nap time was easy because we could still enjoy the sun in the backyard. The super short walk to the beach made it easy for everyone to be on their own schedule and enjoy their days! 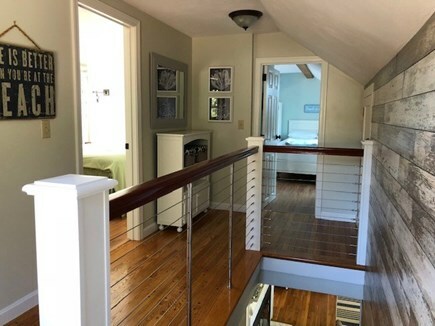 We are partial to Harwichport, and this home has everything, the location to the beach, restaurants and all the activities in the area are amazing! We were so happy with our stay, and all of the communication leading up to our vacation was remarkable! We would love to stay here in the future and would recommend it to anyone looking for the perfect vacation home! We had a perfect vacation in the PERFECT beach house. The description of this beautiful house was precisely the way it turned out to be. It was exactly 0.2 mi. from the beach-- a very easy walk--even with small children and a lot of "stuff!" It was the layout we loved the most. The family room, wet bar, and deck were all at one end of the house. Sleeping in the air-conditioned bedrooms was very comfortable and very quiet. Every inch of the house was very clean, well-maintained, and beautifully decorated. It was supplied with everything we needed. Every time I called or e-mailed Robyn, she got back to me quickly.She even brought her children's wagon from home for us to use. She couldn't have been nicer or more accommodating! I would highly recommend this property to everyone who wants to stay in a house where the owners have taken great pride in their home and property and made us feel so comfortable and welcome. We can't wait to come back! My husband and I enjoy renovating and decorating our home. Actually, I enjoy when my husband uses his many carpentry and general construction skills to incorporate my decorating ideas! This Cape house was completely renovated in 2011, although there is never a year when we don't make improvements. This review sums up what makes our property special. ''This is a great house and property! We spent a week here in August with another family (total 8 ppl, including 4 boys ages 8-12). Everyone had a great time and thoroughly enjoyed our stay. As has been mentioned in other reviews, the house is much larger than it looks, and most importantly, almost feels like 2 different houses. There is the main section with bedrooms, kitchen, etc., then there is another section with large family room and mini-kitchen. Most nights, the kids claimed the family room for their own, and the adults played cards in the dining room. This worked great, giving the kids some separate space. In addition, the house is very well-maintained and clean. There are already many great reviews on this site, so i'll summarize a few things that I thought were truly special. - The Weber grill with direct gas is awesome! We made good use of it, with meats from Ferretti's market in Brewster. - We hadn't planned on playing cards, but we found the poker chip set, and ended up having some great games late into the night. A last comment - the owner was very friendly and easy to work with. I highly recommend renting at 17 Osborne! My parents purchased a home in this quiet neighborhood in 1995 and our family has enjoyed visiting Pleasant Road beach with our children for over 20 years. The location is perfect for walking to many locations. The family friendly beach is only a 3 minute walk. Sundae School is about a mile away so you won't feel guilty eating ice cream after dinner if you walk there. Harwichport center is also about a mile away in the other direction, but it will take longer if you like to take detours down the many streets that lead to the amazing waterfront properties. Chatham is only 8 miles away for your shopping and shark-watching pleasure. Over the years we have also enjoyed exploring the many local Harwich beaches and ponds. If you purchase a beach sticker you can visit over 20 different locations. We have a book filled with wonderful restaurant recommendations by local residents and former guests.